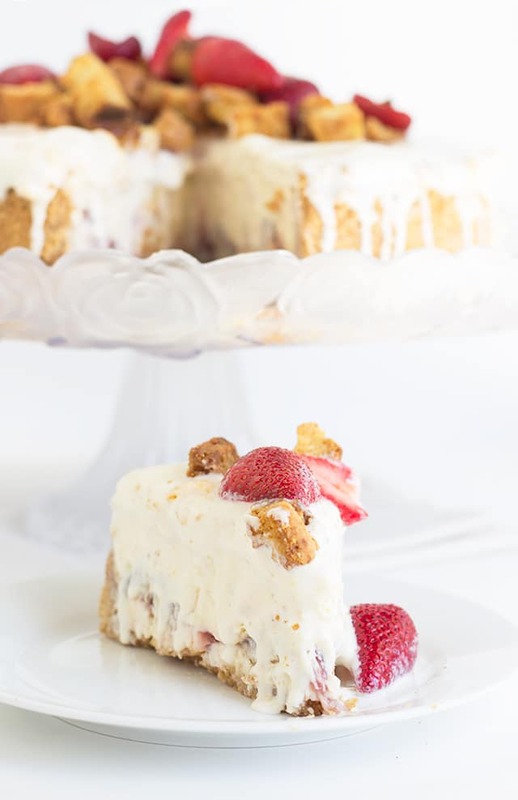 Strawberry shortcake cheesecake is two favorite desserts combined into one. Creamy cheesecake is filled with strawberries, bits of biscuit, and topped with a vanilla frozen custard. 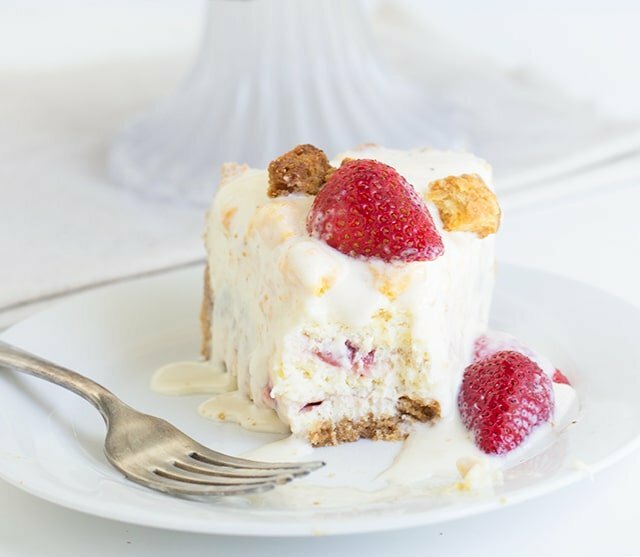 This cheesecake dessert screams summertime fun! I think I’ve found my heaven. 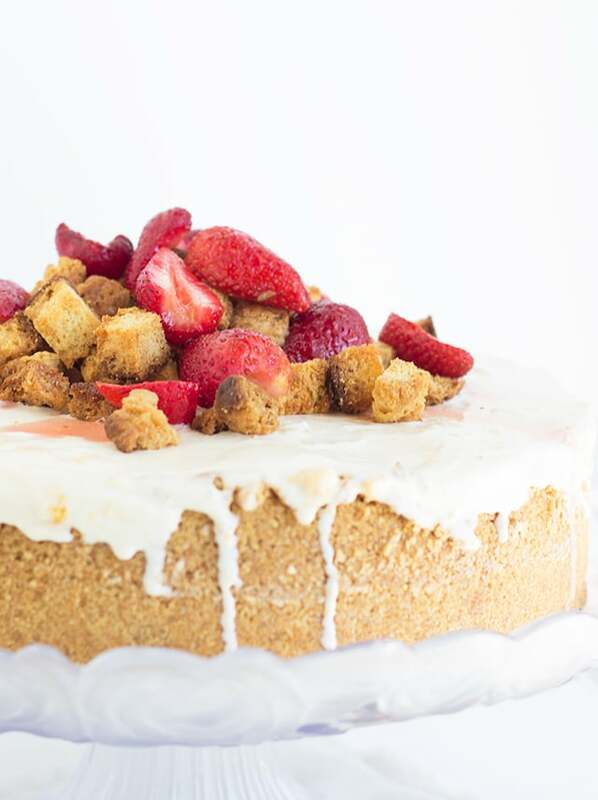 This strawberry shortcake cheesecake is more than my little heart could handle. It’s so full of flavor and has so much more to offer than just being a creamy cheesecake. It’s two desserts in one. What? I made croutons out of the sugary biscuits. They were crunchy, sweet and perfectly golden. The fresh, slightly tart strawberries and the sugary juices softened the croutons slightly. The combination would put a smile on anyone’s face. For goodness sake, I was just describing the recipe to my mama bear on the phone and I could hear the jealousy in her voice. Mama bear and my dad go through phases where they eat strawberry shortcake for dessert for weeks at a time. That’s only in the spring and summer though. Sometimes, when you put so much into a dessert, you have to take it easy on the dinner. That’s how I feel anyway. 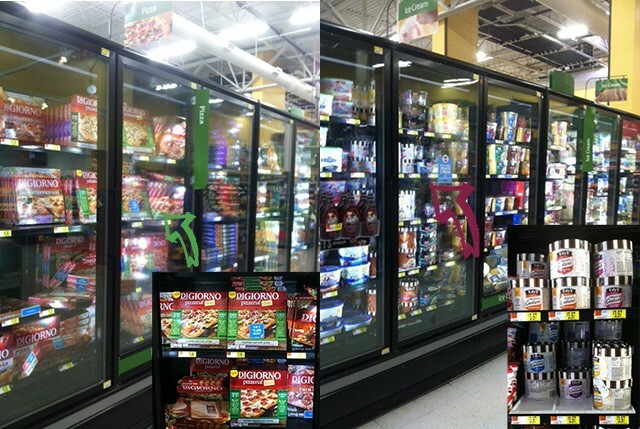 I ran out to Walmart and go the family a DIGIORNO® pizzeria! Supreme Speciale Pizza to feed the family. It’s quick and doesn’t dirty any more pans. Yep, you read that right. It comes with a piece of cardboard that they recommend you bake the pizza on. A++ in my book! It also an inexpensive dinner, which you just can’t beat. 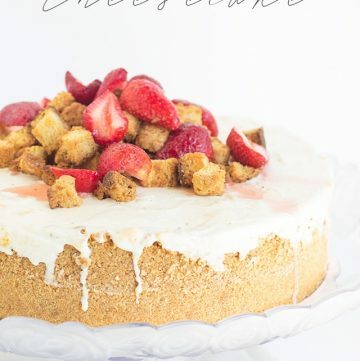 Is it wrong to take a bite of pizza and then of the strawberry shortcake cheesecake? I’ll be honest. It was hard to adjust from the savory pizza to the sweet cheesecake. Not that hard though, because it kept happening. It’s so hard for me to hold off on the dessert especially when it’s just sitting right in front of me. Anyone else feel my pain? While you’re at Walmart searching out a quick dinner solution, you have to stop by the ice cream aisle and pick up some of Edy’s Frozen Custard. It’s inexpensive and tastes amazing! I can highly recommend the old fashioned vanilla and strawberry shortcake flavors. Had ’em both and I loved ’em both. 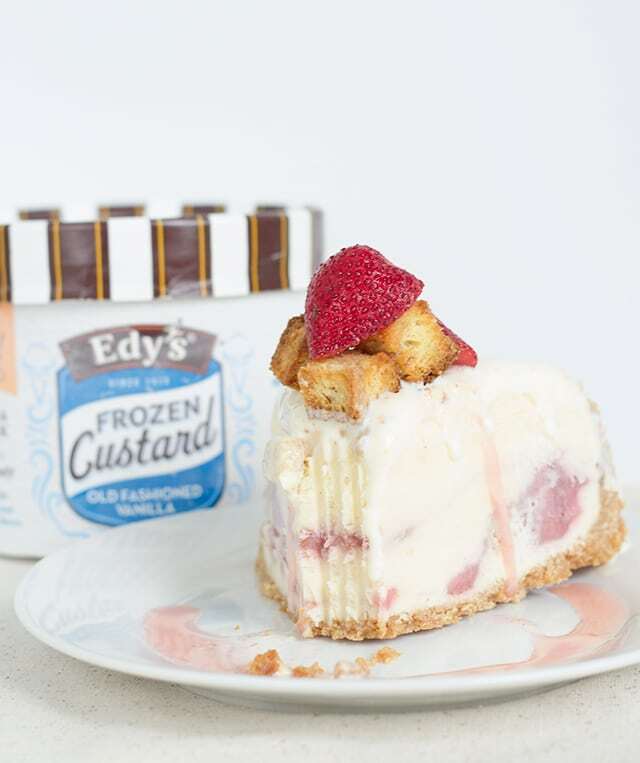 Custard is ice cream’s creamier cousin and Edy’s has no artificial colors or flavors. Everyone can dig that. Now it’s time to create a frozen summer dessert that everyone will love! Preheat oven to 425 degrees. Spray a baking sheet with non-stick cooking spray. If you want to make this step easier, feel free to buy your biscuits. Mine are homemade. In a bowl, add in the flour, sugar, baking powder, baking soda and salt. Stir to combined. Add the milk and vinegar in a cup and let sit while you blend in the cold butter. Using a pastry cutter, cut the cold butter into the flour until all the butter is pretty fine. Small balls are fine. Add the vinegar and milk mixture into the flour. Give it a stir until most of the flour is absorbed. Turn the biscuit mix onto a clean floured surface. Give the biscuit mix 10 to 15 turns into the flour. Pat the biscuit dough down. Cut out the biscuits. Knead once or twice to get another nice ball of dough and pat it down. Cut out the remaining of the biscuits. I got 6. Place the biscuits on the prepared baking pan. Place in the oven and bake for 14 minutes or until golden brown. Let cool. Prepare the 2 cups of fresh strawberries and set aside. In a medium saucepan, add in the sugar and cornstarch. Whisk until combined. Add in the 2 cups of strawberries. Turn on medium heat and mash the strawberries to help release the juice. Once the sauce starts boiling, let it boil until thick, about 2 minutes. Remove from the heat and add in the 1/3 cup of diced strawberries. Stir. Place in a bowl, cover with plastic wrap and let cool. You can speed up the process of cooling off the sauce by placing it in the freezer. I left mine in for about 45 minutes. In a large bowl, add in the graham cracker crumbs, sugar, and butter, Place in the microwave for 1 minute. The butter should be melted. Stir until it looks like wet sand. Press the graham crackers into a 10 inch spring form pan. I pressed my crumbs up the sides of the pan. 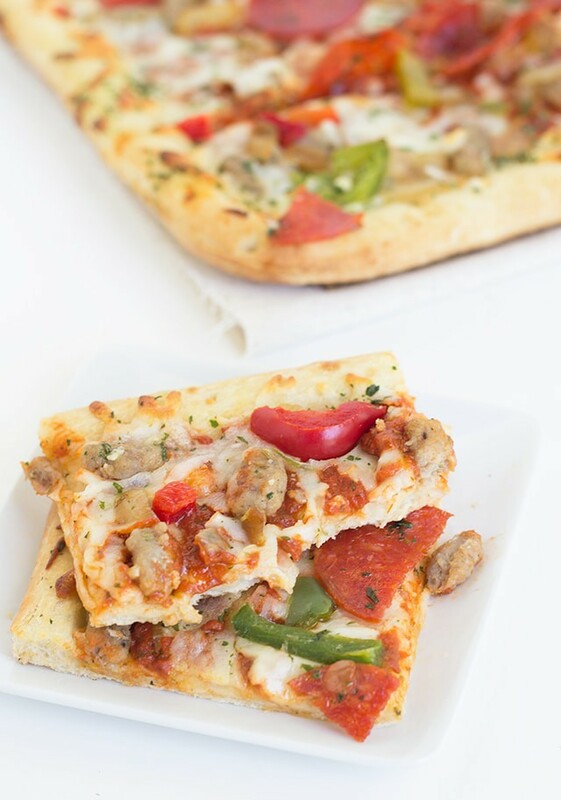 You can make an extra thick crust and just keep it on the bottom of the pan. Place in the oven and bake for 15 minutes until the edges are golden brown. In a large mixing bowl, add in the cream cheese and sugar. Beat until combined. Add in the eggs one at a time and mix until incorporated. Scrape the sides and bottom to make sure everything is incorporated. Add in the sour cream, vanilla, and melted frozen custard. Mix until combined. Place enough of the cream cheese mixture into the cooled graham cracker crust to cover the bottom. Add in 1 biscuit that has been cut up into small squares. Drizzle all of the strawberry sauce over top of the biscuits. Add the remaining cream cheese mixture on top of everything. Give it a tap to help the cream cheese fill all the crevices and not form air bubbles. Wrap the spring form pan with the extra wide heavy duty tin foil. This will prevent the hot water bath from seeping into the cheesecake. Fill a slightly larger pan than the 10 inch spring form pan with 2 to 3 inches of hot water. Place this pan into the oven. Place the cheesecake inside the pan that is already in the oven. Bake the cheesecake at 325 for 1 hour and 10 minutes or until done. To make sure the cheesecake is done, give it a wiggle. If it slightly jiggles in JUST the middle like jello, then it's done. If it jiggles all over, it needs to bake longer. Turn off the heat and crack the oven door slightly. Let it cool in the oven. I kept mine in the oven for about 2 and half hours and then placed it in the fridge. While the cheesecake is chilling, make the biscuit croutons. You can do this by cutting up 1 biscuit. Rolling it in 2 teaspoons of olive oil and baking in an oven at 350 degrees for 15 - 17 minutes until golden brown. You'll want to prepare the strawberries as well. Place the hulled and halved strawberries in a dish with the sugar. Stir. Cover and let sit until the cheesecake is ready to be topped with the frozen custard. Remove the frozen custard from the freezer to thaw slightly. This will make it more spreadable when topping the cheesecake with it. I let mine thaw for about 30 minutes. Once the cheesecake is chilled, scoop the remaining frozen custard onto the top of the cheesecake. Spread it out evenly. Place in the freezer to set up. I would recommend it setting up at least an hour. Once the ice cream is set up, remove it from the spring form pan. You may need to use a knife to release the sides from the pan. 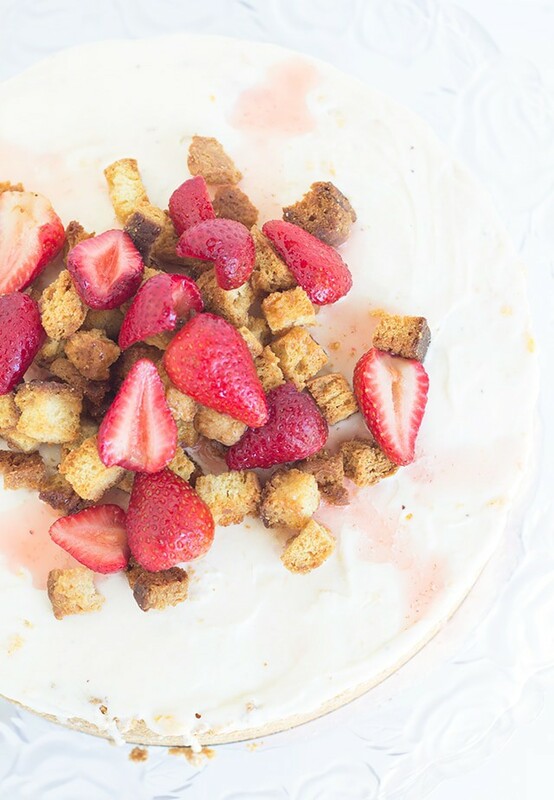 Top the cheesecake with the biscuit croutons and fresh strawberries. Cut and serve immediately! Social media is all the rage. If you want to head over and check out the brands, I’ll leave the links here for you. 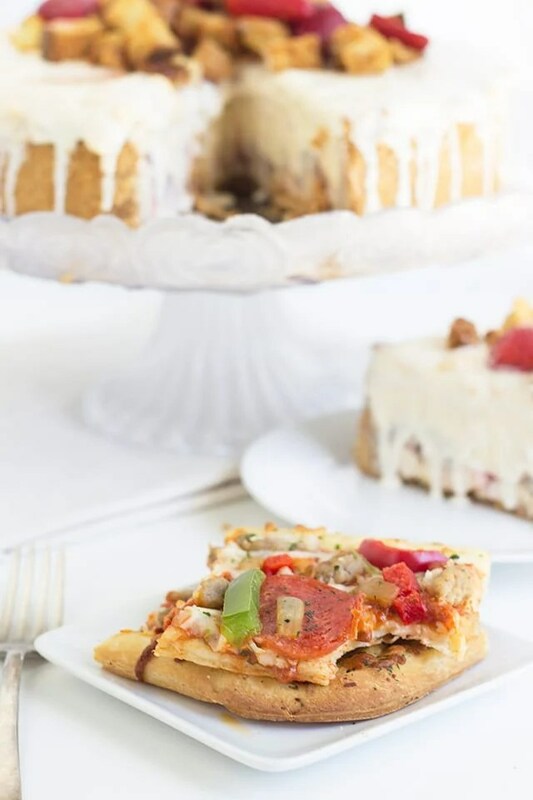 Check out EDY’s® Facebook and Pinterest along with DIGIORNO® at Twitter and Facebook. Have you ever made a traditional dessert into a non-traditional one? 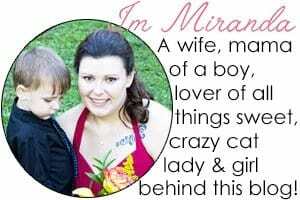 I would love to hear what your creative concoctions are! Awesome recipe and super pretty photos as always. 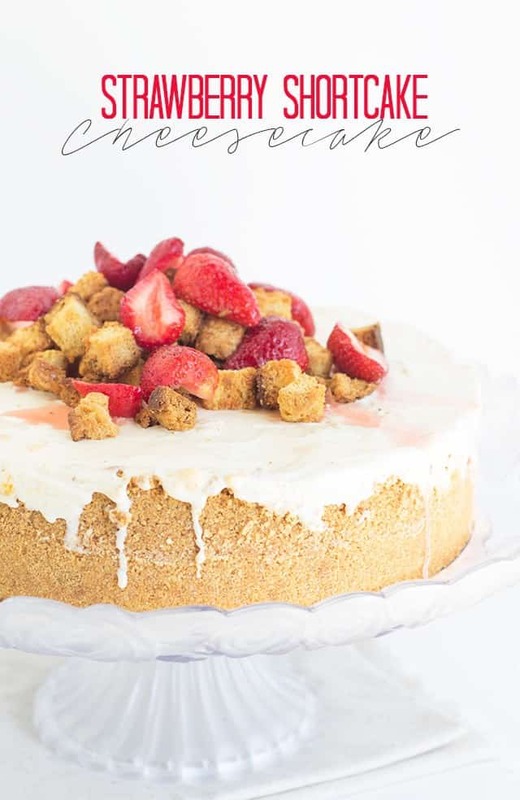 We love your blog, hope you can become Chicory’s official recipe partner ! I love the idea of making “croutons” for on top! Everything about this looks delicious! I have a question on the Cheesecake portion of the recipe … step 10 Place the cheescake inside the pan that is already in the oven. Bake the cheesecake for 1 hour and 10 minutes or until done. I’ve read it several times and have not found a temperature for the oven … or is the warm water bath what you are referring to. I’m in the process of making it for my sister’s birthday tomorrow. I got your e-mail Becky! I made corrections on the recipe for you! I hope your sister loved the cheesecake! I was wondering if we had to use the custard in the cheesecake? Would is make a huge difference if i didn’t? is it for flavor or for texture? Or could i use cool whip in place of the custard? It’s for flavor! 🙂 You can use heavy cream instead.